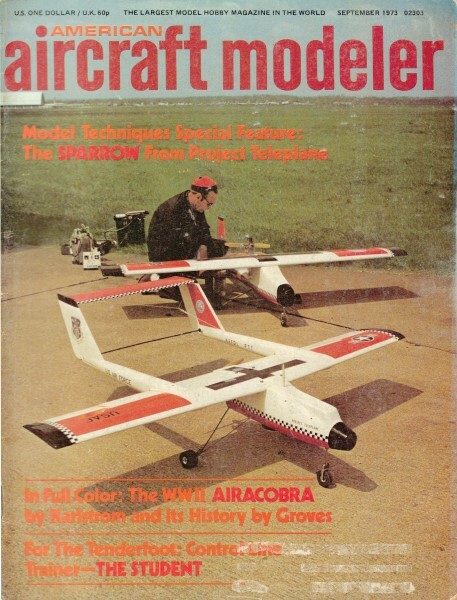 The September 1973 edition of American Aircraft Modeler featured a combination C/L and R/C, 1/6-scale model of the Spezio Sport DAL-1 Tuholer homebuilt airplane. A 3-line systems is used for C/L so that throttle can be controlled. 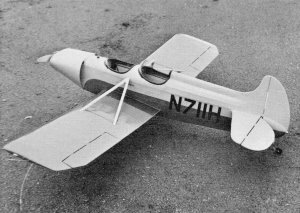 Both versions call for hinged, movable ailerons and rudder, with those surface being staked to a fixed position for C/L flying. Control Line Scale model with good stunting ability for those extra points. It is also perfect for RC Stand-Off Scale. The selection of a Scale subject for today's competition is one of the most difficult tasks facing the Scale modeler. Gone are the days when all that was required was a close resemblance to a set of questionable three-view drawings, a non-scale glossy finish, and lots of bent pins and thumbtacks in the cockpit. Often the meet was won by the only ship able to struggle into the air and complete a lap or two without the Scale crash bit. To win in Scale today one needs a model that appears to be a real aircraft magically shrunken to model proportions. This must be backed by complete documentation in the form of accurate and detailed drawings, photographs and specifications. 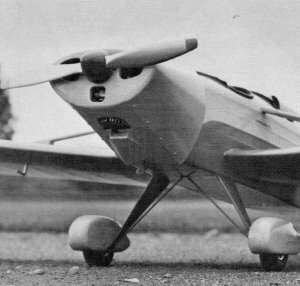 The Tuholer was chosen as a scale subject for its good moments and ample wing/tail/ rudder areas. That's a real good-looking pose. Would you believe a 35 is adequate power even for stunting? By all means use the throttle for scale points, realistic takeoff and touch-and-go. How about that nifty scale tail wheel? It's worth several scale paints. Cockpit is simple-it needs the full pilot and instruments treatment if you can avoid weight buildup. Symmetrical stunt airfoil is evident in this view of the model. What it costs in lost scale points is easily made up by optional maneuvers. Ailerons and rudder are fixed for flight unless you fly it RC. By visiting the larger meets and reading model magazines it becomes apparent that a new trend is developing: the scale homebuilt. There are many good reasons for this. 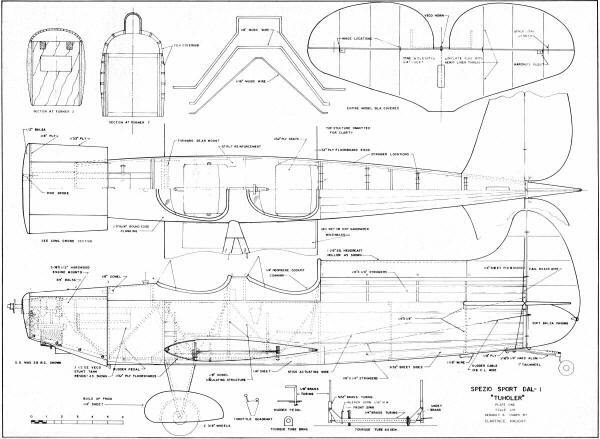 Any aircraft built in the home workshop, for example, can be duplicated part by part by the modeler if he so desires. There are usually no elaborate fittings or forgings to duplicate and similar materials are used in constructing the model. Another advantage is that authentic scale documentation is usually available from the original designer! Also on the plus side are the variations seen on given homebuilt designs such as cowlings, wheel pants, etc. Be careful on this one, however-you must be able to document your version. If the variation desired is difficult to document, then you are better off building a scale model of the prototype. You may, however, exercise some freedom in paint schemes and numbers as long as the original design is utilized. Before selecting the Tuholer as a subject, I researched eight airplanes in this general category. I settled on the Tuholer for a number of reasons. My first interest in Control Line flying is stunt and I wanted a subject with aerobatic capabilities. The Tuholer has ideal moments and nearly 500 sq. in. of wing area. With an adequate engine this plane will not be aerobatically disappointing. In fact, the ship flies like a typical non-flapped stunter, and is smooth and responsive. I made two scale deviations on the original: a symmetrical airfoil and an enlarged horizontal stabilizer. The plan shows the scale stabilizer length, but if you are not interested in aerobatics, the ship will handle well with the smaller tail surface. Deviations from scale must be listed in your documentation and will cost you a few points; they are minor compared to the aerobatic flight points possible with the slight modifications. 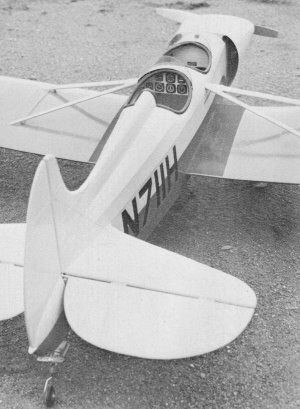 Sport Aviation, the official publication of the Experimental Aircraft Association, has a lengthy article on the Tuholer. Both issues are available and have three-views with dimensions as well as an excellent cutaway view giving many usable details. 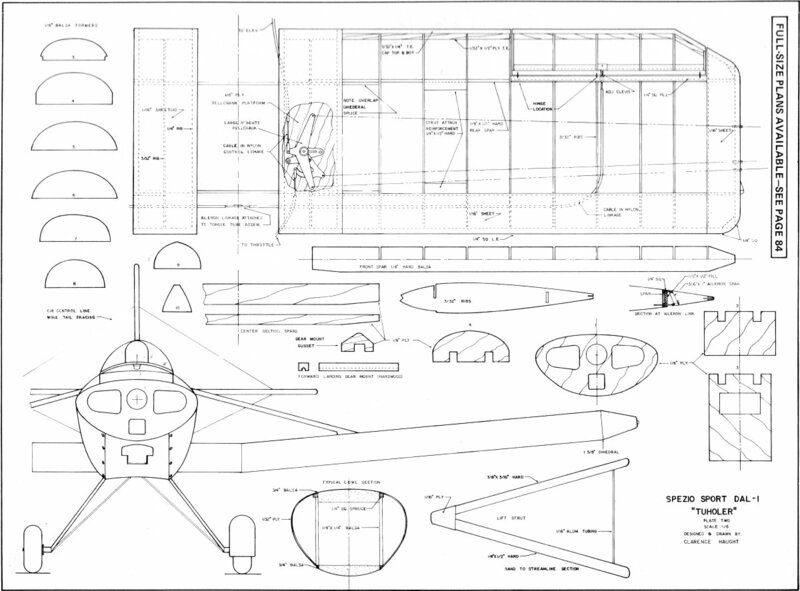 Plans including many photographs are available from designer Tony Spezio for construction of the real airplane. There are several features any scale model in this category should include. In general, adhere to scale rib and stringer locations as well as proper control hinge locations. Fabric areas should be silk-covered and finished with enough dope to fill sufficiently, but the fabric weave should be visible. Sheet metal covered areas should be well filled with the proper "edges" apparent. Any sheeted areas, such as leading edges, should be duplicated and trailing edges made as unobtrusive as possible. The cockpit should have moveable rudder pedals and sticks that follow control movements. Scale structure should be visible in cockpit area; instruments, switches and secondary controls should be properly located and duplicated. Give careful attention to tail-wheels as many points can be added here. Throttle control on the engine is well worth the effort, however the added drag of the third wire will make aerobatics risky unless an engine in the 40-45 class is used. You will have to be the judge. The Tuholer is not a beginner's project so this will not be a glue-stick-A-to-former-B article. My comments on construction are limited to specific details which may be of help. 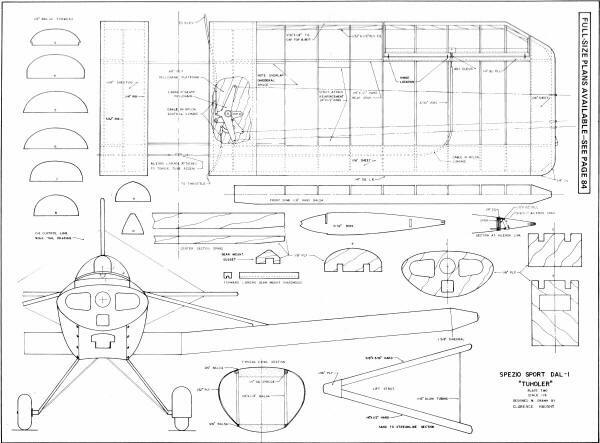 The fuselage should be started first and is simply sheet sides attached to the plywood former and engine mount assembly. Stringers and sheet fillers complete the sides. Formers in the after fuselage are built up from 1/8 x 1/4" strip stock and the sides are joined at the tail post. The fuselage construction should stop at this stage to allow easy assembly of wings, tail surfaces and landing gear. The wing is built next. The inboard center section rib spacing is dependent upon actual fuselage width so this dimension may need to be altered on your plans. The wing is completely assembled without left upper center section planking (over bellcrank) and installed as a unit into fuselage. Simply notch fuselage from the bottom for spars and slip wing upward into fuselage against the 1/4" sheet filler. Add lower filler sheet and wing installation is complete. for the bell crank mount. The tail surfaces are made of 1/4" sheet with nylon thread used to simulate ribs. Silk covering applied over the balsa and simulated ribs will provide a scale appearance without the delicacy of a built-up surface. You will note an extra elevator horn on top of the stabilizer as well as the regular horn below. The upper horn provides correct stick movement in the cockpit in relation to elevator movement. The bellcrank is attached to the lower horn by means of a flexible cable in a nylon tube. Anchor the nylon tube in several places. If threaded clevises are used for connections, solder them in place after final adjustment to prevent working due to vibration. All cockpit detail and controls should be added at this time. The "backside" of fabric covering in the cockpit area can be simulated with Silkspan doped to the balsa sides. 1/32 x 1/16" balsa laid flat will simulate stringers. Structural tubing is l/S" dowel finished with zinc chromate Aerogloss. Rudder pedals are soldered up from l/S" brass tubing and hinged to the 1/32" plywood floorboard. Front and rear pedals are linked with piano wire to a 1/16 x 1/4 x 3" dural strip pivoted beneath the floorboard at the rear. At final assembly, 018 control line cable completes the hookup to the rudder horns. The torque tube assembly is also made from brass tubing soldered together and attached to the floorboard before installation as a unit into the fuselage. Coordinate this assembly step with the landing gear assembly. Cockpit seats are 1/32" plywood. Don't forget seat belts. Make the buckles out of sheet aluminum and the webbing out 1/2" braid from the sewing shop. Commercially available instruments may be used. I used World Engines instruments in the rear cockpit only. However, if you purchase instruments, you must list them in the documentation under "parts not constructed by builder" and this will cost you points. They can be made using photographic reproductions of the faces with frames fashioned from bits of metal. Fuselage construction resumes after all controls and cockpit details are complete. There are no stringers on the bottom. The area around the cockpits is metal on the real ship and is made up of 1/4 x 1/8" round edge planking and finished to simulate a metal surface. If you mask around the edge of sheet metal areas prior to building up the finish with filler, you will obtain a slightly raised edge, which can be carefully beveled to simulate a metal-to-fabric joint. This should also be done where the side stringers meet the 1/4" sheet filler in the area of the wing leading edge. Cockpit coaming is 1/4" neoprene tubing with a quarter of its cross section cut away to allow a good fit to the cockpit edges. Attach with epoxy glue. Wing struts should be made up and fitted to the model utilizing round toothpick alignment dowels. They should be finished separately from the model along with the cowling and attached with epoxy after the finishing process. The cowling on this ship attracts more attention then anything else, but it was actually quite easy to construct. Attach top and bottom balsa blocks to former No.1. Two 1/8 x 1/4" vertical members hold them in alignment temporarily as shown in the typical cowling cross section. Slip the cowl in place and shape the top and bottom blocks. Next add 1/4" sq. spruce to both edges of the balsa blocks. Allow clearance for the 1/32" plywood side pieces at the top. Glue plywood side pieces to top block with epoxy. Wet plywood and pull around former No.1 and down to bottom block. Secure with masking tape and allow to dry at least 24 hrs. The tape is then removed and the formed plywood cowl sides are glued in place; four No.3 1/4" metal screws are added to simulate Dzuz fasteners and help secure cowl sides. A front block and a scoop are added to complete the cowl. Attach cowling with bike spokes and one alignment dowel as shown. No cutouts were made for exhaust or needle valve on the original. The inside of the cowl was coated with epoxy glue for a sealer. The cowl is removed and the engine is started and adjusted prior to going to the flight line. The cowling is replaced prior to flight and the engine is restarted while you hold the model inverted in stunt fashion. The exhaust will echo inside the cowl and provides a realistic sound. There is plenty of air circulation to carry .away the exhaust and to cool the engine. Some attention should be given the tail-wheel assembly. Look at some full scale tail-wheel assemblies and try to du-plicate them. A simple wire sticking out with a wheel attached will detract greatly from the scale appearance. I used 1/16 x 1/4" aluminum for "springs" and small copper wire with solder flowed around it for "clamps." The swivel bearing was adapted from an RC nylon tail-wheel bracket. Take your time on the finish. Silk seems to handle best if it is drawn down over a previously doped and sanded structure and adhered with a brush dipped in thinner to activate the dope underneath. After water shrinking, apply enough dope to seal the fabric but not so much that the fabric effect is lost. Here again it will pay to look at some real aircraft finishes and try to simulate them. Very few have hand-rubbed glossy finishes on fabric. However, some homebuilts will, so you may want to weigh this decision. Be sure of the center of gravity location. It should be two in. behind the wing leading edge with the fuel tank full. If the CG is too far forward, you have takeoff problems on rough fields as the tail comes right up on takeoff. Since this ship has moveable ailerons and rudder, they will have to be locked before flight. I tie the rudder over hard right with rubber bands between the fuselage lift handle and the rudder horn. Be sure this doesn't bind the elevators. For initial flights you may wish to set the ailerons to assist in maintaining the line tension (I use hat pins for this). You will find the ship easy to fly and, if you have throttle control, beautiful touch-and-goes are possible. Just set the model up nose high with a little power and gradually reduce throttle as she settles in. Prior to flying aerobatics with your Tuholer you will want to cover your bets by careful preflight checks. First of all, the flying surfaces must be in perfect alignment with no warps present in the wing. A warp that will aid in maintaining line tension in normal flight will work against you in inverted flight, possibly causing you to lose the airplane due to slack lines. If your ship weighs over 55 oz., you are getting near the maximum for stuntability especially with a three-line control setup. The added drag of that third line really shows up in aerobatics. Use the minimum wire diameter allowed by the rules and 55 ft. length. A good strong 40 is necessary for aerobatics. Set it up with about 1½° of offset to the right to insure good line tension. The ailerons will, of course, have to be secured in the neutral position. I use a 11 x 5 prop but the ship does fine on a 10 x 6. The longer prop looks better with such a wide cowling and is nearer scale diameter. Stunting a scale ship may seem sacrilegious but, if the model has the capability, why not garner those extra points offered in the rulebook? These maneuvers consist of loops, wingovers, figure eights and inverted flight. If you're not an experienced stunt flier, do the maneuvers you can and let the rest go. I am hesitant in recommending the vertical wingover, however. This is an extremely simple maneuver, but I feel it places the model in undue jeopardy. Engine failure or even hesitation is more critical in this maneuver than the others because line tension is marginal at best and, if the wind is blowing, it tends to be worse. Loops and eights are done directly downwind with line tension aided by the wind. I nverted flight should be entered downwind with subsequent recovery downwind also. Generally speaking, inverted flight is safe in moderate wind which shows little or no effect in normal flight. Figure-eights in scale should be the type known as lazy eights and not the type shown in the aerobatic rules. In fact, this maneuver is one of the best training maneuvers for the beginning stunt flier as it gradually leads him into inverted flight and overcomes his fear of giving "down" control at the handle. The maneuver is entered from a shallow dive adding up elevator until two-thirds of a normal loop is completed. The elevator is momentarily neutralized resulting in a shallow inverted dive. Down elevator is then applied to accomplish the "outside" portion of the maneuver recovering in level upright flight; this results in a lazy or stretched out horizontal figure-eight. Whenever you fly aerobatics, be prepared to abort the maneuver at any time and return to level flight even if it means inverted level flight with a dead engine. Inverted dead stick landings are hard on rudders, but attempting to get right side up without sufficient speed, altitude and line tension usually results in a serious crash. Even if you can resist aerobatics you'll find the Tuholer one of the greatest flyers yet to invade the scale circle. Several of my friends have suggested that the Tuholer would make a nice RC model. I must agree and plenty of radio space is available in the wing center sections and under the seats. Either way I think you'll like the Tuholer.